LONDON--(BUSINESS WIRE)--Technavio analysts forecast the global LED market to post a CAGR of more than 16% during the forecast period, according to their latest market research report. The growing number of households and urbanization is one of the major trends being witnessed in the global LED market. The increase in urbanization is driving the installation of new lamps and LED luminaires which in turn, will lead to an increase in unit shipments and thereby revenue from LED products. In addition, rapid urbanization is driving governments of various countries to invest in large-scale urban infrastructure projects. The manufacturing cost of LEDs has declined since 2012 and will continue to do so during the forecast period primarily because of the declining ASP of chips and components used in the manufacturing process. This is leading to a decrease in the installation costs of LED lamps and fixtures thereby driving the installation of new LED lamps and fixtures across all application segments. This global LED market research report provides market segmentation by application (general lighting and backlighting, automotive lighting and others), and by region (the Americas, EMEA, and APAC). It provides an in-depth analysis of the prominent factors influencing the market, including drivers, opportunities, trends, and industry-specific challenges. The high demand for energy-efficient lighting solutions in the general lighting market is expected to fuel the demand for LED products. This segment is expected to increase its market share by close to 29% over the forecast period, while the backlighting segment is expected to see a significant decrease in its market share. APAC held the largest share of the market in 2017, accounting for close to 47%, followed by the Americas and EMEA respectively. APAC and the Americas are expected to witness a significant increase in their market shares while EMEA will see a commensurate decrease in its market share over the forecast period. 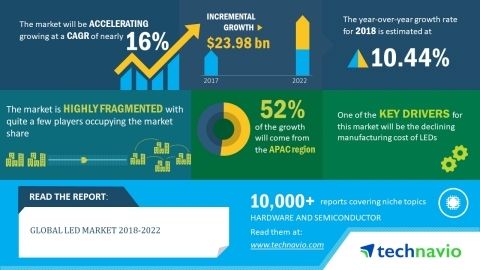 Technavio analysts forecast the global LED market to post a CAGR of more than 16% during 2018-2022, according to their latest market research report.